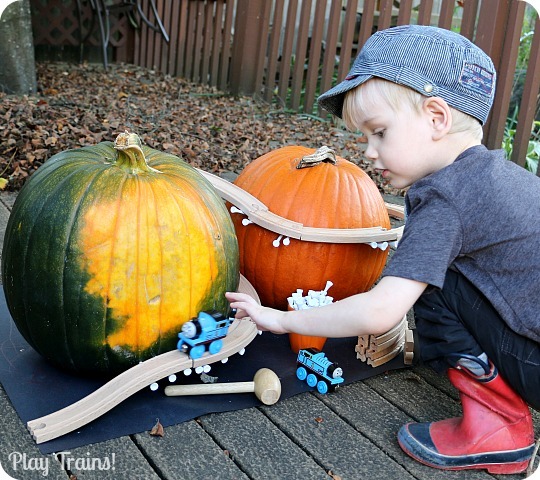 We’re back with another great Halloween train activity: building a mountain railroad on a pumpkin. Well, two pumpkins, in our case. Once I started setting up the train tracks, we were having too much fun not to bring in the second pumpkin! The other fantastic bloggers participating in the Halloween Invitations to Play series — Mary Catherine from Fun-a-Day!, Chelsey from Buggy and Buddy, Stephanie from Twodaloo, Rachael from Nothing if Not Intentional, and Shaunna from Fantastic Fun and Learning — all have fun ideas for you today as well, so don’t miss the links to their posts at the bottom of the page. 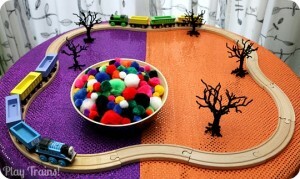 If you’re new to this series, or to invitations to play in general, you may be interested in reading my introduction in the Play Dough Pumpkin Patch post from the fall series (it’s a brief introduction, but there are links to three great posts by experts on the subject), or my thoughts on adding trains to invitations to play from last week’s October Moon Train Play post. This particular invitation to play started with a field trip to Picha Farms’ pumpkin patch in Puyallup, Washington. 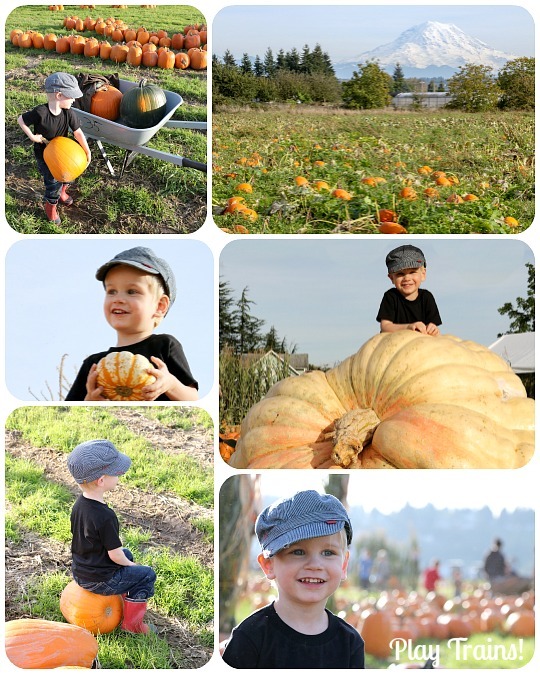 The Little Engineer had so much fun running around, looking at pumpkins, and finding things to climb on. (Apparently the giant pumpkin was off limits, but we didn’t overhear that until after I snapped the cute photo! And I wasn’t the one encouraging him on that one.) They also had a slingshot for flinging mini pumpkins across a field, which is always a hit. I think my favorite part was when he insisted on carrying his own pumpkin to the wheelbarrow and almost got it in all by himself. While he played, I was scoping out pumpkins. 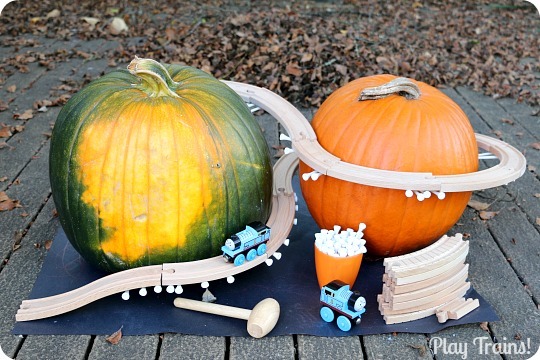 I had this crazy idea that I could use golf tees to support wooden train tracks spiraling around a pumpkin like a real railroad clinging to the side of a mountain. Nuts, right? It totally wasn’t going to work. But once I saw it in my imagination, I had to try it! So I found some nice, round pumpkins that looked like the might be similar in size and curvature to a large circle of track. To my great surprise and delight, it worked. The golf tees held up the track! 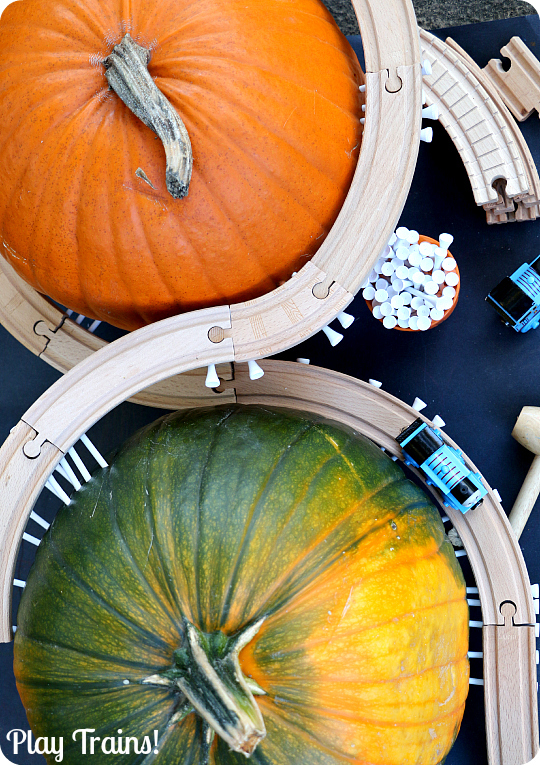 So I built a railroad curving around the pumpkins in an incomplete figure eight. This would be a two-fold invitation: it could be played with as-is, running trains up and down the tracks, or the Little Engineer could add more golf tees to the pumpkin and try to add onto the railroad himself. Both ways of playing allow for practicing fine motor skills and exploring scientific concepts (gravity being the main one). The set up for this one took a little more work than I usually put into our invitations to play, but it was so worth it. 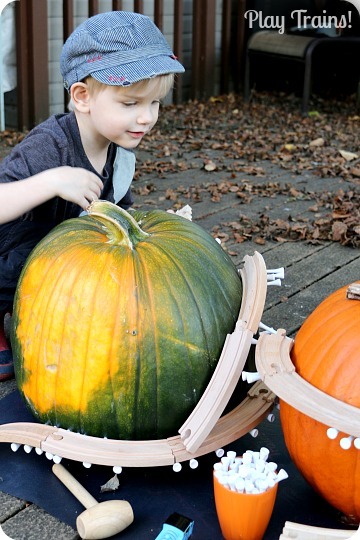 Start by lining the ascending track up beside the pumpkin, angled so that it could connect smoothly to track on the ground. Holding it in place, position a golf tee beneath the upper end and push or pound it into the pumpkin. Use a couple more tees, following the underside of the downward slope to support this track. 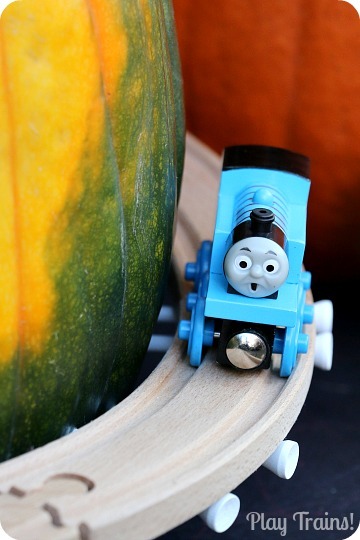 Then add a curved track, angling it slightly upward alongside the pumpkin. Use two to three golf tees beneath each point where tracks join. A tee or two in the middle of a track is helpful as well. Keep spiraling upward around the pumpkin as best you can. No pumpkin is going to be perfectly round, or the perfect size, but you can pound the golf tees in more or less to compensate to some extent, and use short curved or straight tracks to bring the railroad in line with the pumpkin. 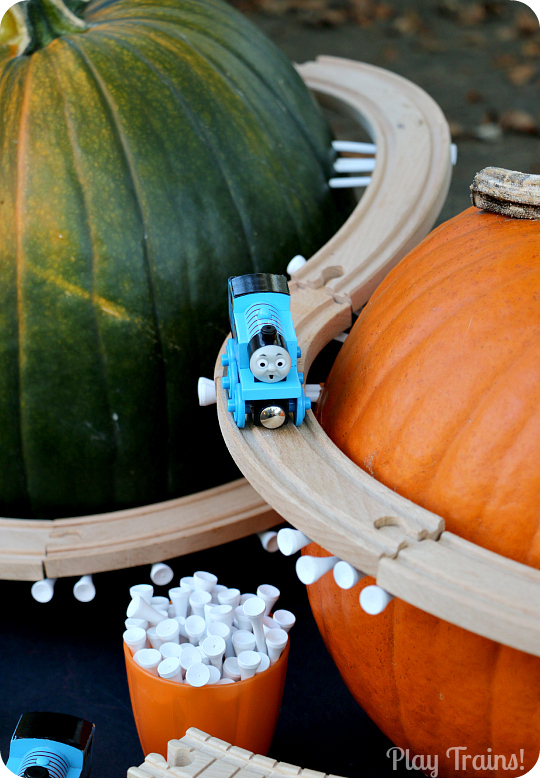 If you want to use two or more pumpkins, place them approximately a track-width apart and switch the way the tracks curve as they pass between the pumpkins. Once you’ve built as much track as you’d like, arrange more tracks, golf tees, the mallet, and the trains around the pumpkins. The Little Engineer noticed me going outside to set this up, so he was hovering nearby, very eager to take over from me! 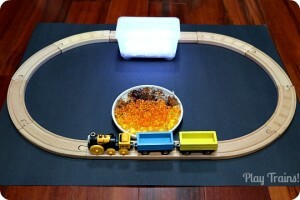 First, he sent Thomas spiraling down the tracks I had made. He had to give his favorite engine quite a few nudges to keep him going at the top. But the slope must have been just right near the end, because Thomas shot off the ramp while the Little Engineer giggled. Then he tried to add onto the end of the tracks I had built. It didn’t take long for them to topple over. The Little Engineer grinned and exclaimed, “The tracks fell into the sea!” And then he had fun helping the rest of the tracks join them in the imaginary waters below. 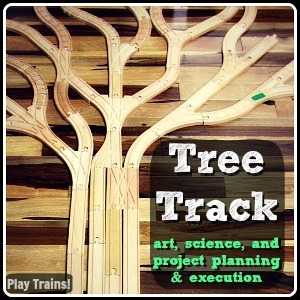 Next, he decided it was his job to build a new track above the old one. He pounded several tees into the side of the pumpkin. 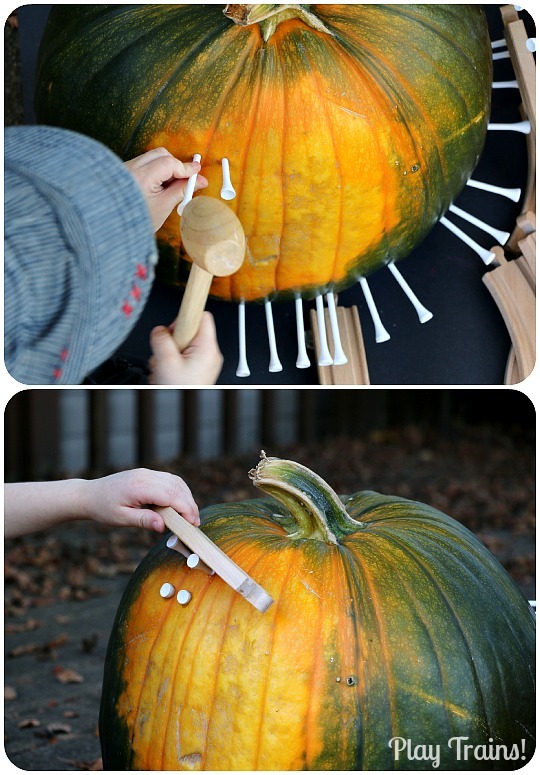 He tested them with a track and experimented with leaving different lengths of the golf tees sticking out of the pumpkin. 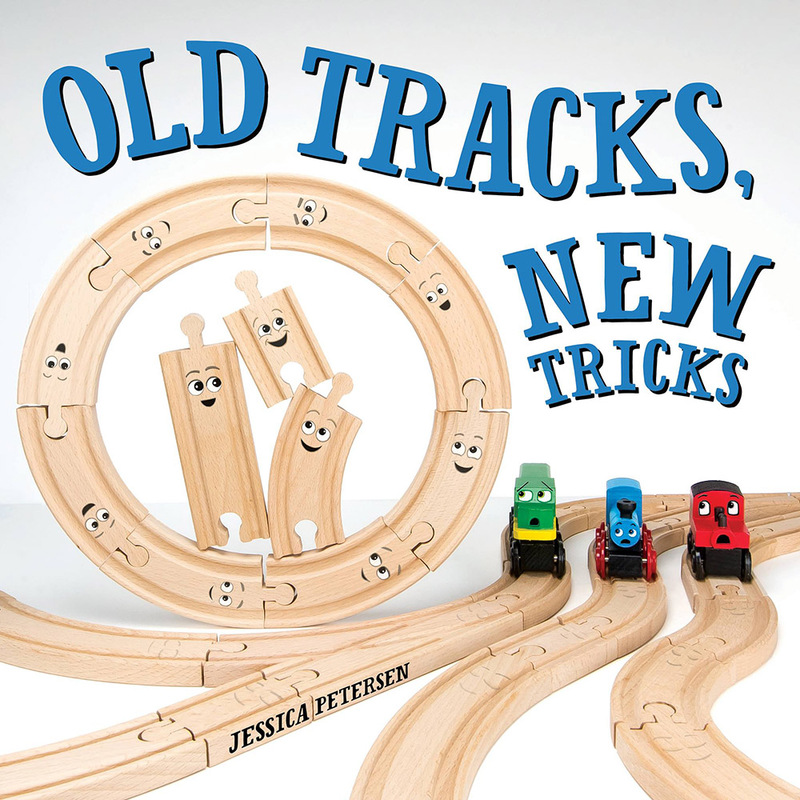 He learned from experience that they did a much better job holding up the tracks when he didn’t pound them in all the way. I’m not sure which of us had more fun with this one! We were both laughing about the same amount the whole time. Now that you’ve seen our Halloween invitation to play for this week, make sure to check out what my wonderful blogging friends have dreamed up this week! Whoa!!! This is just too cool for words, Jessica! Wow!! I am so totally amazed with this!! 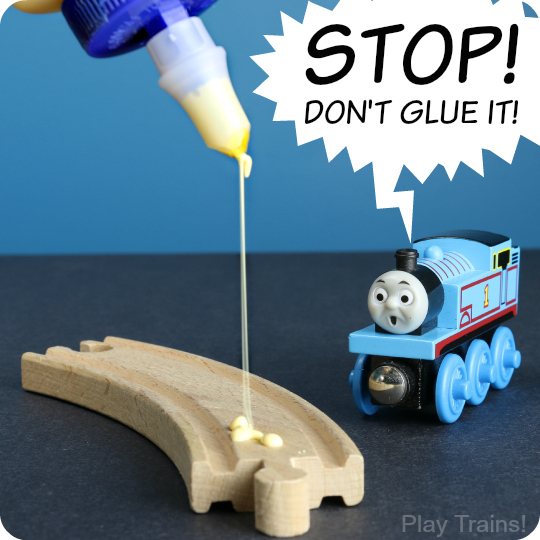 How in the world do you come up with these super cool train ideas??? LOVE!! Jessica, you are a creative genius. Seriously – who else would think of this?! SO cool!! Way cool!!!! A show stopper again! 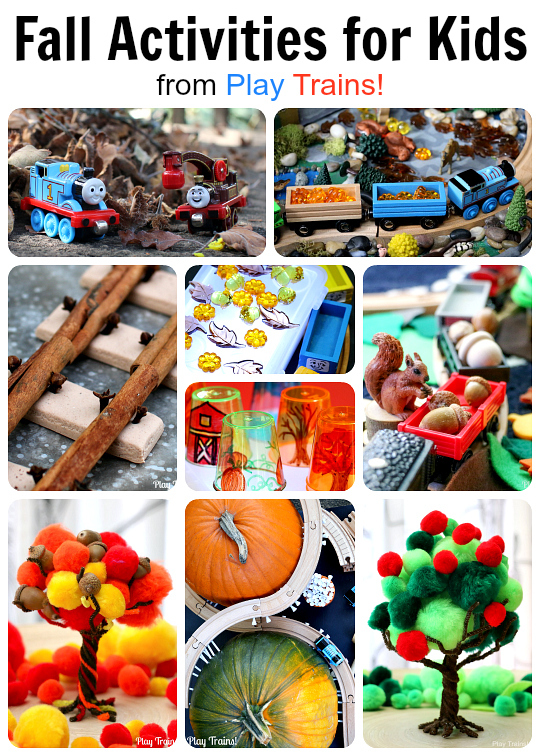 You’re invitations remind me of beautifully designed store front displays for toys stores. I cannot even express how much I looooooooove this!!! 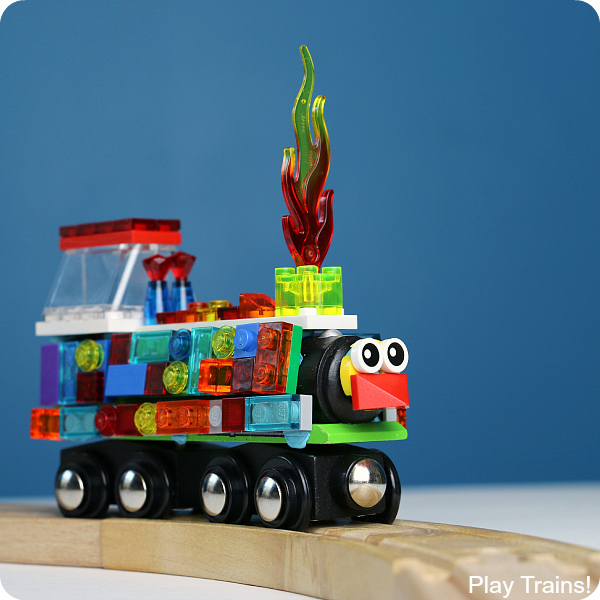 You and Little Engineer are so very creative. My Engineer is going to have such fun with this. I absolutely LOVE this idea. I have a golf-loving husband and a Train-loving son. This is brilliant. Pinning now. Wow, that is AMAZING! What a brilliant idea! Awesome!!! I love that you used golf tees as supports. Great job!